The basic purpose of an ecommerce solution is to allow businesses to develop, operate and maintain online sites or stores without any added cost or effort on the part of the owner. Ecommerce solutions are designed to provide convenient accessibility for online shopping, secure payment integration, online customer service as well as regular updates and enhancements to pull traffic to the site. 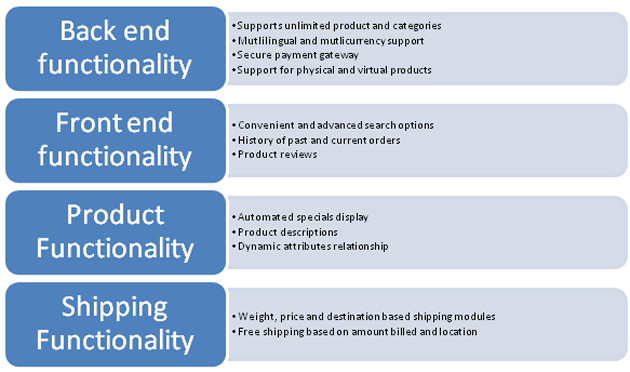 Advanced ecommerce solutions are highly customizable with ability to provide upto 4,000+ updates and new features. Almost all ecommerce solutions are designed to be compatible with all kinds of web servers with no added equipment. They also generally include different language options as well as currency exchange rate facility based on the geographies and customer base served by them. B2B – Business to Business, also referred to as Electronic Data Interchange (EDI), so called because the solution is provided for businesses who to sell to other businesses who in turn sell either in the same form or with modifications to the end user. This is the most widely used ecommerce solution, constituting approximately 90% of all ecommerce transactions. Business to Consumer or B2C is comparatively newer ecommerce solution, wherein the end user gains access to the buyer’s network to conduct a transaction, facilitated via internet. This has gained a lot of popularity in the recent times, offering convenience of purchase. 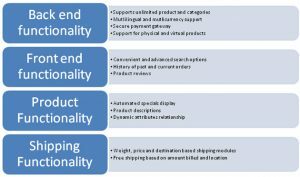 Consumer to Business or C2B is a relatively new and fast growing ecommerce solution wherein a customer or end user makes a specific service request from the business owner, for instance a planning a holiday package etc. Business to Employee or B2E ecommerce solution is also known in organizational parlance as an intranet. A rapidly growing ecommerce solution, its purpose is to provide information to employees of an organization and is usually accessible through the organization’s network. Consumer to Consumer or C2C are typically auction sites, wherein consumers put up certain items for commercial auction. The ecommerce solution enables other consumers to access the items available on bid and place bids, and then provides a link for both buyer and seller to complete the transaction, and charges a fee for the service. A well designed ecommerce solution can give you that much needed competitive edge to get ahead of your competitors, therefore ensure that you do thorough planning and research on the features to include in your ecommerce solution.